Here's to Hero--the source of endless inspiration! 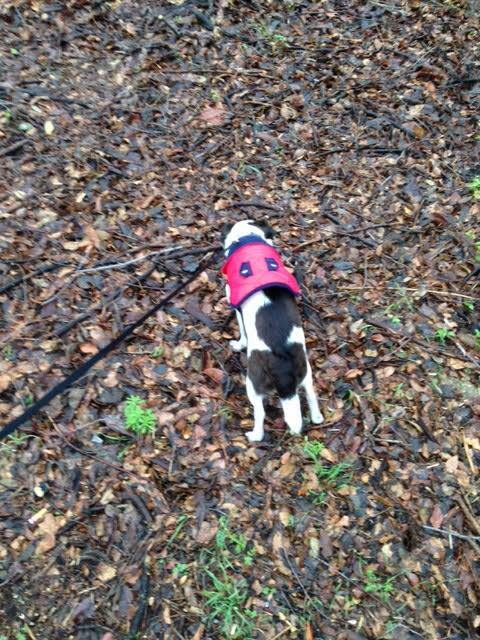 Hero is ALL ABOUT the four times a day we go for a stroll. He sniffs every tree and blade of grass along the route. AND THEN, something catches his nose---literally and he is hoovering what ever the scent is in high suction mode. If your nose was able to ingest--he would swallow the scent down. I have looked and looked and cannot discover what is so interesting about a particular spot. Some spots only get the precursory sniff--and then there are these dognip smells I cannot drag him from. Perhaps Senorita Conchita Chihuahua has marked the spot--perhaps the hated neighborhood feral cat--and perhaps a morsel of human food hit the spot---I will never know--my nose powers are limited. 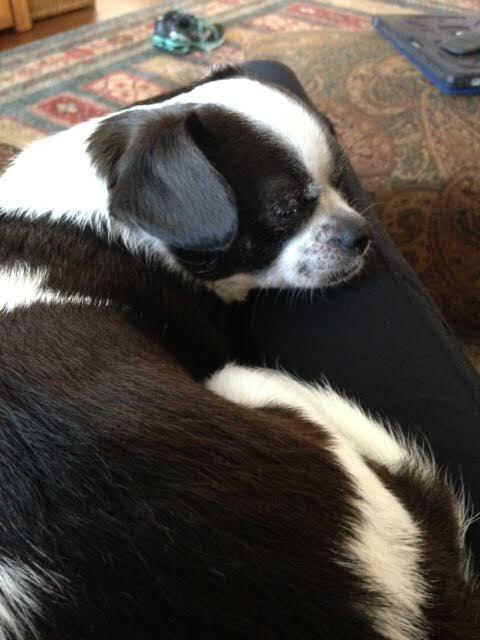 While Hero LOVES his walks and dances with glee when I pick up the leash, he is NOT such a fan of walking in the rain. He tucks that tail and looks at me with those sad eyes as if he is saying, "YOU HAVE GOTTA BE KIDDING!" 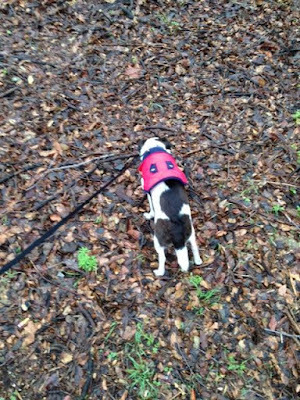 AH--but there is no choice--so Lulu dons the rain boots and rain coat--even my rain pants a time or two and off we go. He is NOT HAPPY--BUT we do not come in until the job is done! You would think it would click -If I use the first bush by the door--we can go back in side. NO--he is a little thick headed. What Hero hates even more than the rain is when it is a stormy day and we have no choice but to walk in the thunder. He is a BIG chicken-thus he sits around shaking when he hears a strange noise, I act like I am leaving, or the littles walk through the door. Hero is a coward! As we walk through the rain, he tucks that tail, and creeps along as if I might change my mind or perhaps the rain will go away. Unfortunately until he learns to use the potty, we have no choice but to walk through the storm. The good news for Hero is I never send him out to walk alone-I am always by his side and when the deed is done--we go home and I have a towel waiting by the door. He is thoroughly rubbed and dried and given an extra treat for completing the mission in spite of the storm. He comes out on the other side of the wet walk with me holding him, caring for him, and supplying all his needs plus some. So it is with life--we are forced to walk through the storms of life at times--there is no avoiding them. Thankfully we never walk alone and He is by our side in the worst of times--comforting us as we travail the stormy path. When the day comes that the clouds lift and the sun once again shines down upon us, we discover He never left us--never deserted us--and supplied all our needs before we even knew what we needed. Though life may be stormy--our faithful Master is always by our side. Whoever goes to the Lord for safety, whoever remains under the protection of the Almighty, can say to him, “You are my defender and protector. You are my God; in you I trust"
Why do dogs require so many walks? And then ... last thing at night, I let our dog out in the garden so he can water a tree or two. Nor mally he goes out OK; but not when it is raining or very cold. So I have to do it by proxy by going out against a tree !!! Then there is the cat. He insists on going out for a walk with us. So I put him on a lead, left the dog at home, and took the cat for a walk. Unfortunately I fell off a tree. Now I have a skating board. I put both the dog and the cat on it and wheel them round for their daily walk. Every so often, the dog barks, I stop, he gets off the skating board, sniffs at a tree, then gets back on and we move again. Then the goldfish wanted to join us too. So I bought an old baby pram, put the dog, cat and goldfish bowl in it, and we go out for a walk three times a day. The goldfish loves it when it rains. I hope the mother-in-law does not decide to join us. There is no room in the pram for her too. They have you well trained, Victor ! !